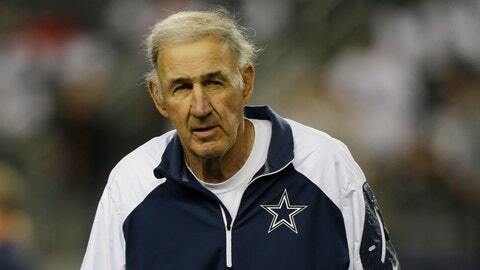 I thought it would be impossible for Dallas Cowboys owner/general manager Jerry Jones to bring back Monte Kiffin in 2014. His unit was much worse than anything Rob Ryan put on the field during his two-year stay, but Jerry indicated Monday that Kiffin (and offensive coordinator Bill Callahan) would be back in the saddle next season. Jones will spend the offseason talking about the "inordinate" amount of injuries the Cowboys suffered on defense. He will give the 74-year-old Kiffin the benefit of the doubt based on his past accomplishments. But something tells me that even Kiffin’s surprised by being retained after such an embarrassing season. It was time to make him a consultantâ¦or just let him retire. Unfortunately, the benevolent heart and delusional mind of Jones trumped all other options. Firing Kiffin or demoting Callahan would cause Jones to admit he made a mistake, which is something he loathes doing. "I had a guy tell me one time how to be successful, that no human can be right over 50 percent of the time on any decision, but it’s the ones that cut the bad ones off quick and let the good ones run long," Jones said while attending Senior Bowl practices in Mobile, Ala., on Monday. "That’s hard to do. That’s hard to accept. We all know that adage of the gold miner who walked away and the other one who took one more swing, hit the pick and found the gold streak, and so you don’t want to quit." We also know about the Arkansas "gold" miner who hasn’t hit a lick in 17 years. After one season of MonteBall, I’m pretty sure the Cowboys aren’t on the verge of striking anything but .500. Of course, it’s not all Kiffin’s fault. Jones talks about knowing when to cut off the "bad" decisions. But he’s the one who held on too long to Jay Ratliff. His belief that Ratliff would somehow change his brooding ways helped cost the Cowboys a chance to land a defensive tackle in last April’s draft. Jones shouldn’t bring up advice that he’s chosen not to follow. He nearly always waits too long to part with players (see Terence Newman, OU Roy Williams, Ratliff, etc.). I wish Jerry would save us all the trouble and admit the truth on Kiffin. He owes the man another year’s salaryâ¦and doesn’t want to leave any money on the table. Jones has always thought assistant coaches were a necessary evil. And that’s why the thought of paying a lot of money for Kiffin to sit at home is too much for this billionaire owner to bear. Try to follow Jones’ rationale for sticking with his defensive coordinator. "Just the fact that you made a lot [of moves] last year probably minimizes the need to make them this year," Jones said. "And you look at the fact that you’ve decided scheme-wise that you liked that in competing in the NFL today. Then that [prevents] you from cutting that short. I didn’t want to cut it short over on defense, and some of the same principles are true cutting it short on Jason. I’ve talked about that I want to be here for the payday, and this is payday time with Jason." Jerry’s basically saying, "These guys can only go up from here." Yet other organizations such as the 49ers, Saints, Eagles and Chargers hired head coaches and had immediate success. This idea that you have to hit rock bottom with a coach before you can experience success is so misguided. But the only man who can change the Cowboys’ course has no inclination to do so.